Def Leppard guitarist Phil Collen and his trainer Jean Carrillo were interviewed in January by Full Contact Fighter magazine. You can watch part one of the video interview online featuring Phil and Jean explaining their fitness regime. 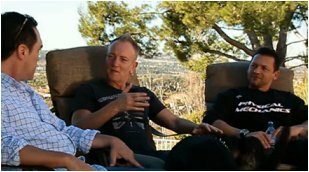 The video was filmed at Phil Collen's home in Laguna Hills, California. Phil talks briefly about the end of the Def Leppard Mirrorball tour before talking about Muay Thai kick boxing and nutrition. At the end during a preview of Part 2 Phil mentions the Poison tour. "Poison are great guys. I've known them for years and Rikki's wonderful so it would be good. It looks like we are gonna be touring."